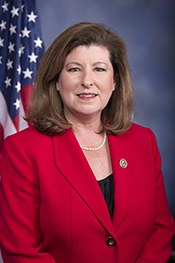 HANDEL, Karen, a Representative from Georgia; born in Washington, District of Columbia, April 18, 1962; graduated from Frederick Douglass High School, Upper Marlboro, Md., 1980; attended Prince George’s County Community College, Largo, Md. ; attended University of Maryland University College, Adelphi, Md. ; business executive; staff, Governor Sonny Perdue of Georgia, 2002-2003; chairwoman, Fulton County (Ga.) commission, 2003-2006; Secretary of State of Georgia, 2007-2009; unsuccessful candidate for nomination for Governor of Georgia in 2010; unsuccessful candidate for nomination to the United States Senate in 2014; elected as a Republican to the One Hundred Fifteenth Congress, by special election, to fill the vacancy caused by the resignation of United States Representative Tom Price (June 20, 2017-January 3, 2019); unsuccessful candidate for reelection to the One Hundred Sixteenth Congress in 2018.